Ghostweather R&D Blog: Victoria's Secret Market Research? Or not. 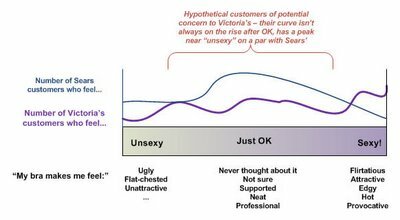 They see themselves as offering the consumer a fantasy rather than reality, so how can a bra be thought of as uncomfortable? Out of touch doesn't begin to describe these people. One of the things I like about you is your weird history with the fashion industry :-) Or is that, your history with the weird fashion industry. I was amazed VS was even doing a survey, but then, it's the hot thing now. I get inundated by requests to give feedback on sites and fill in surveys everywhere I turn. Customers are being asked for their input, but then it's being done badly, being analysed badly, or worse, being ignored once it's collected. There is a huge gap between collecting data and making decisions and changing course based on data. It's one of the "crimes" towards customers that bothers me most in the business world. Perhaps this is just one of those surveys that were proposed by the marketing department?